Her amazement only grew when she saw the young man whose body lay in Snow White’s coffin. His heavy, golden curls were in perfect contrast to his iron pillow. She thought she might have seen him once before in one of her picture books—a royal footman or some other background servant, who blended perfectly with the richness of the palace—just an ornament for the story. She pulled herself to her feet and gazed down into the coffin. He seemed to smile up at her with dimples that would have been more appropriate on a boy half his age. “He’s enchanted, you see?” Father Androcles put an arm around her shoulders, but Maddy barely noticed. “We have to get him out of there.” She ran both her hands along the glass, trying to find some way in. There had to be a hinge somewhere. A lock. A handle. Something. “He’s not breathing!” She lifted a fist to punch through the glass. 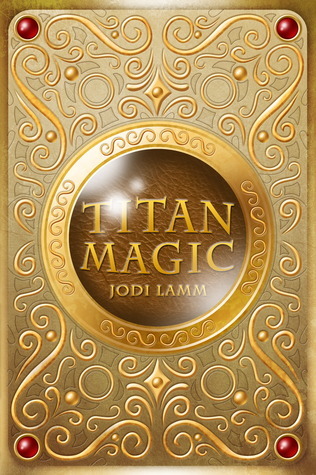 Thanks to author Jodi Lamm, I have paperback of Titan Magic to give away to one lucky winner! To enter*, leave a comment on this post telling me why you want to read this book OR your favorite character/creature from folklore. Make sure to check back later in the event for my review of Titan Magic! Wow, that is some interesting excerpt. I am definitely going to check this book out. If I had to choose a favorite character or creature from folklore (in the broadest sense), I would have to say Elphaba, the Wicked Witch of the West. She is complicated and flawed, but at least she fought for what she believed in.....and I'm not talking about shoes here. LOL. I want to read this book because fairy tales. I'm not complicated. My favorite creature from folklore is totally Pegasus, followed by unicorns. Because I'm still a tween at heart. Ok, I just read the blurb here and this just looks like a dark and crazy retelling and I would love to read this because I love the dark aspect of Fairy Tales (I am a bit morbid that way I guess). My favorite creature from folklore are trolls because they are small and cute but also VERY nasty at times...again I say, I am a bit dark that way. I want to read this book because the incorporation of Snow White into this passage has me very intrigued. I'd like to read this one because I love when authors blend mythology and folklore in new ways! From the excerpt this one already seems unique and interesting. I want to read this book because it sounds really amazing and it seems like a really interesting new take on Fairy Tales. My favorite folklore creature is The Chimera because it is just awesome and powerful. One of my favorite fairy tale characters is the maiden without hands. And I'd love to read Titan Magic because I love clever retellings and mixtures of folklore, myth, and/or fairytales. I enjoy fresh takes and piecing together what I already know. 1) I want to read this because that excerpt totally grabbed me! I love that there would be a DUDE in Snow White's coffin, and the creep factor that if he woke up, he'd kill you? I'm so intrigued. I want to read this one because I'm despertly trying to build up a fantasy pile and this would be a great edition! My favorite fairy tale character is the wicked witch in Snow White. She just always scared me half to death when I was growing up. This book sounds really mysterious and I'm always keen to read more mystery stories. Not to mention the cover looks so pretty. This book looks very interesting, so I just bought the ebook. Thanks for the review! I think fauns are interesting creatures! I've never heard of this book before, but the excerpt was great and it make me want read this book. Thanks for sharing!! TITAN MAGIC looks amazing. The cover is just to die for too. I cannot wait for you review of this one. I love the excerpt but the only Titans I know are from Greek mythology so I need to know about this one. That's why I want to read it. Is Titan a family name for a line of royals? Is he Sleeping Beauty in the male form? I need to know!! My favorite creature from folklore is the Kirin (a mythical hooved Chinese chimerical creature). I have never heard of this before but it sounds amazing! The only titans I have heard of have been in greek mythology. But this book sounds like it has a amazing combinations of fairytale elements in it! My favorite creatures from folklore are fairies!!! Some of my favorite books have fairies and I just love how authors come up with so many worlds and characters that have to do with fairies!!! This book sounds fantastic!! What a great twist for a re-telling of Snow White! Id have to say a werewolf. Hell-freaking-yeah! My favorite creatures from folklore are fey/fairies!! I love this cover. I love reading about magic. I love fairy tales. This book sounds great! Thanks for the chance to win! I'd love to read this to expand my "self-published" shelf, and my favorite mythological creature, the Sphinx. This sounds like an interesting fantasy tale. Thanks for sharing it with us. I had never even heard of this book, but after reading the excerpt I would like to read more. Thanks for sharing, and for the giveaway.